A spotted gar was caught in Chicago's North Shore Channel by the Illinois Department of Natural Resources. The species hadn't been found before in the Chicago Area Waterway System. The fish was weighed and returned to the water. WEST RIDGE — Biologists withthe Illinois Department of Natural Resources made an ancient discovery Wednesday when conducting an electrofishery survey on the Chicago North Shore Channel. 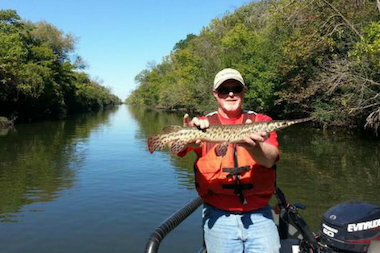 During the survey, which was looking for Asian carp, a spotted gar instead floated to the top of the channel. It's the first time ever a spotted gar, whose ancestors are 100 million years old, has been found within the Chicago Area Waterway System, said Solomon David, a postdoctoral research associate at Shedd Aquarium. "It's kind of cool, and hopefully it's not a one-time find," said David, of Lakeview, who wrote his dissertation at the University of Michigan on the spotted gar, one of seven species of the primitive fish. The gar, which David estimated to be 2-feet long, was found on the channel near the West Ridge-Skokie border. It was examined and quickly released back into the water. The fish are common in the lower portions of Illinois, but they had never been found this far north until Wednesday. David isn't sure how the fish made its way into city waters, but it's possible the gar came through the Calumet River into Lake Michigan and then into the Chicago River Downtown before migrating through several North Side neighborhoods to the North Shore Channel. David said spotted gar require clear water and a high degree of vegetation, so the gar's presence in Chicago may indicate habitat improvement in the area. "A lot of times you won't find fish unless water quality is suitable for them," David said. The fish almost certainly was wild, as it featured more vibrant colors than captive gars, which have a "little shorter snout and are a little more drab," David said. The gender of the fish could not be determined without an internal inspection, which was not conducted, David said. Spotted gars can live up to 18 years old, can reach 3 feet in length and can weigh as much as 8 pounds.